Yes-Game.com: Yes it’s possible to play over a thousand games on one site. 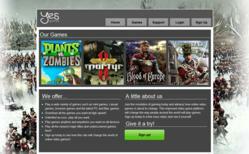 Yes-Game.com will launch in May of 2012 and promises to change the face of online video games for PC and Mobile. The site is currently undergoing rigorous testing and will launch by the end of May 2012. Yes-Game.com is a new site launched in May of 2012 and aim to revolutionize the videogame industry. Yes-Game.com has license deals to over 1600 top PC and mobile games and offers its members a very simple and quick way to access all the games with an inexpensive monthly subscription. Any members can download any games they want directly to their PC or mobile devices without putting in any payment information, making the process seamless and lighting fast. Yes-Game.com makes downloading and playing games extremely simple to allow members to enjoy the site without any hassle. Yes-Game.com has several top titles from game developers such as Plants vs Zombies, Thief and Tomb Raider with more and more games added every week. Yes-Game.com’s monthly service offers all a wide range of game category such as shooter, RPG, action, fantasy and even learning. Members will only need to download a lightweight application to their desktop to manage their download and the games will be queued automatically. This will allow the members to play games within a minute across multiple devices and even multiple computers.